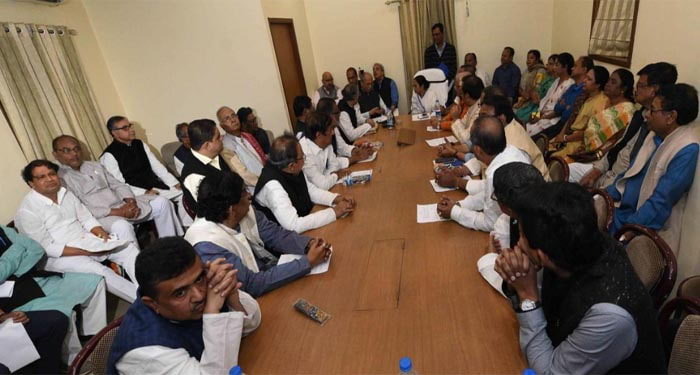 Mamata Banerjee holding a Cabinet meet at Metro Channel. On Monday. Kolkata: On a day Chief Minister Mamata Banerjee’s dharna against the CBI entered the second day, finance minister Amit Mitra presented the state Budget for 2019-20 fiscal year in the Assembly amid noisy protests by Left and Congress MLAs. 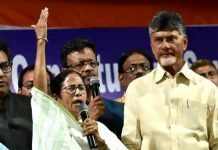 Mitra rushed to the Assembly in the afternoon after the Chief Minister chaired a meeting of the state Cabinet in a traffic control room near her dharna venue at Metro Channel and approved the Budget for presentation. But as soon as Mitra began his Budget speech in the Assembly, Left and Congress MLAs rose in protest in unison against the allocation of less time for discussion on the Budget and demanding payment of pending dearness allowance (DA) to the state government employees. The Opposition MLAs, with posters slung from their neck, tore the budget papers and took to massive sloganeering. 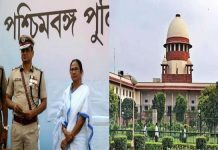 As they got down on the well of the Assembly and advanced towards the finance minister, security personnel took positions guarding the finance minister and Speaker Biman Banerjee. Despite this, the noisy protests continued. Congress Chief Whip Manoj Chakraborty even climbed a chair and continued leading the chorus of sloganeering. CPI-M MLA Tanmay Bhattacharya was leading the Left camp. Amidst the protest, Mitra continued and, at the end of the 40-minute budget speech, it turned out that no allocation has been made for the payment of pending DA to the employees. 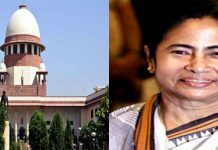 This is even as following the fifth extension granted by Mamata government since 2015, the Sixth State Pay Commission is scheduled to furnish its report in May. Asked about this by reporters later, the finance minister said that the matter will be taken up once the Pay Commission furnishes its recommendations. “Since 2011, we have released 125 per cent DA. So far as Pay Commission’s recommendations are concerned, we will take steps once the Commission gives the final report,” Mitra said. The Budget size this year is Rs 2,37,964-crore as compared to 2,14,959-crore last year. The projected deficit for this Budget is only Rs 9-crore. Continuing with the thrust on development projects, an allocation of Rs 89,300-crore has been proposed in the Budget for plan expenditure. This is 13.25 per cent higher than last year. The next big ticket allocation has been made for social sector initiatives, which includes various kinds of aid, welfare measures, soft loans, etc. The allocation here is Rs 41,131-crore, as compared to Rs 38,000 that was allocated last year. As regards health and education departments, the Budget allocations stand at Rs 9,556-crore (health) and Rs 27,541-crore (education). This is a rise of 11 per cent and 11.4 per cent, respectively. Infrastructure sector, which pertains to physical asset creation such as building roads, bridges, irrigation canals, etc., has been allocated Rs 8,806-crore. This is up by 13.84 per cent over last year. The allocation for the agriculture sector too has seen a jump ~ from Rs 2,766-crore that was allocated in the last Budget to 6,086-crore this year.